You may have received the offers in the mail or heard about it online: banks are handling out cash bonuses to new customers that open a savings or checking account. These offers can range from $25 on up to $300. But why would a bank give out this much money for free? It’s simple really. Banks hope to turn new account holders into lifelong customers. If a client already has a deposit account with a bank, they will be comfortable doing more lucrative business with the same bank, such as applying for an auto loan, home mortgage, or an investment account. If you’ve seen our Banks.org high interest rate savings account comparisons but are curious about lower interest rate accounts that offer a bonus instead, read on. Expiration Date: You will need to open the requested type of account before the date the offer expires. Good Standing: You must keep the account open and in good standing for a certain number of months. You cannot open the account and then close it once you get the bonus. If you close the account too soon, the bonus will be deducted. Initial Deposit: You may need to open your account with some initial amount and keep at least this much in the account for a certain length of time. Direct Deposit: This is one of the more difficult requirements to meet. You must setup one direct deposit within a certain time frame, usually within 60 days of opening the account. Some banks may require you to setup more than one direct deposit. Activate Online Banking: You may be tasked with creating an online account with the bank’s website or mobile app. However, you are likely to do this anyway when joining a bank so this is an easy one. Activate Online Bill Pay: This common requirement means that you must signup for bill pay through your online account and add at least one bill to be paid monthly. In the Mail: Many banks send out postcards and letters advertising a bonus if you open an account. These advertisements will contain a unique code printed on it. Take the offer code to a local branch to apply and receive the bonus. You will likely need to get on the bank’s mailing list to get an offer in the mail. One way to do this is to signup for a credit card offered by the bank. Directly: Contact your local bank directly either by phone or by checking their website. Many banks provide details about their new account offers right on the front page. 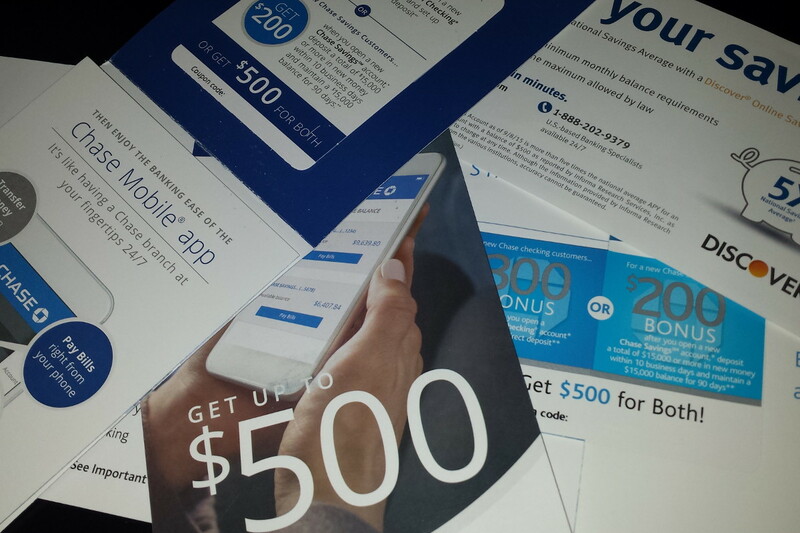 Chase $500: Chases gives out $300 for new Chase Total Checking costumers and $200 for new Chase Savings customers. You can take both offers. This one requires a code that you can only get through the mail. Sign up for a Chase credit card to get added to their mailing list. You can also try visiting the Chase banking website or calling them at 1-877-242-7372. Discover $120: Although Discover is primarily known for their credit card, they also offer banking services. For more info about their signup bonus, visit the Discover checking account or the Discover savings account sections of their website or call 1-800-347-7000. Santander $150: Santander Bank is a fairly new bank to most Americans. Based in Spain, Santander is expanding throughout the United States and seeking new customers. To receive the $150 bonus, add direct deposit and meet the other requirements listed on the Santander checking new account offer page. Offer Bonus or a Higher Interest Rate? Sometimes it makes sense not to take a bank up on its new account offer! You may not want to jump through hoops to get the bonus, such as setting up direct deposit or online bill pay. You might prefer a specific small-town local bank that has friendly customer service and meets your needs. Lastly, you might prefer a higher interest rate on your deposit. High rate accounts usually do not offer a signup bonus but have fewer requirements and lower fees. In the long run, the interest you receive will exceed any one-time signup bonus. See our Savings Account Rate Comparison page for a list of these types of accounts sorted by highest interest rate.